Delicious shrimp curry made with Thai green curry paste. This authentic Green Curry Shrimp recipe takes 20 mins to make and tastes just like restaurants! 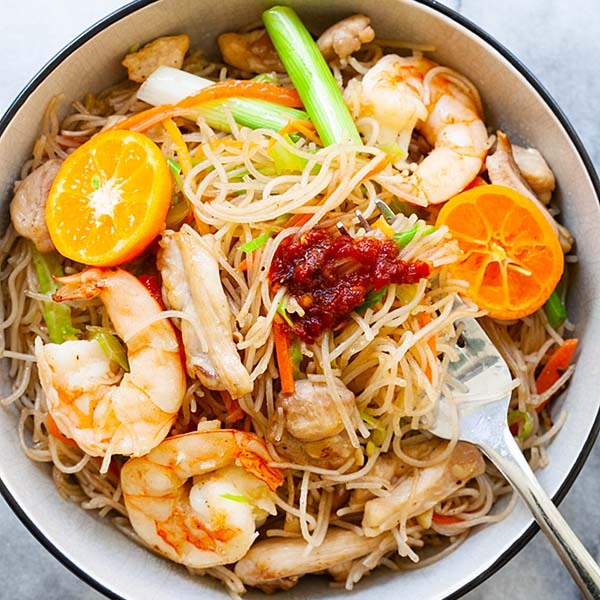 Serve with steamed rice or favorites such as Chicken and Pineapple Fried Rice, Pad Thai and Thai cucumber salad for a complete meal at home! I love curry and I love shrimp. So when you combine both of them together, with Thai green curry paste, you get this mouthwatering and authentic Thai shrimp curry. Green curry is one of my favorite Thai recipes. It’s usually made with chicken, but today I am going to teach you how to make green curry with shrimp. It’s mildly spicy, loaded with coconut milk, savory and sweet at the same time. 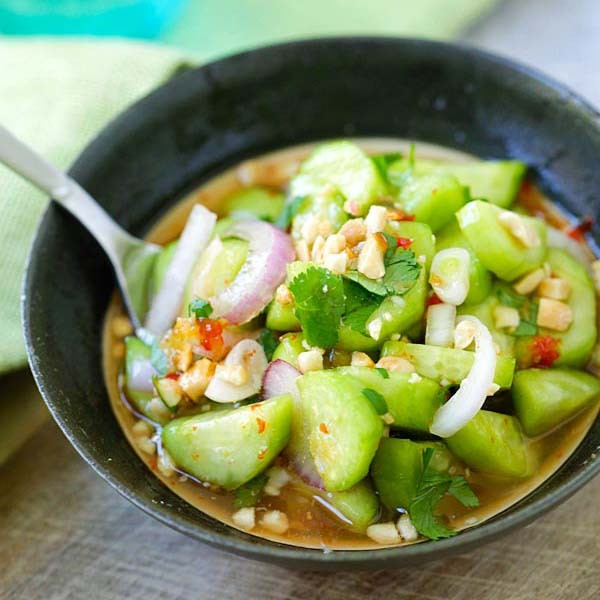 You can make green curry paste from scratch and I will share the recipe with you one day. For everyday cooking and a quick homemade Thai curry at home, you can use store-bought curry paste from Asian stores or online. 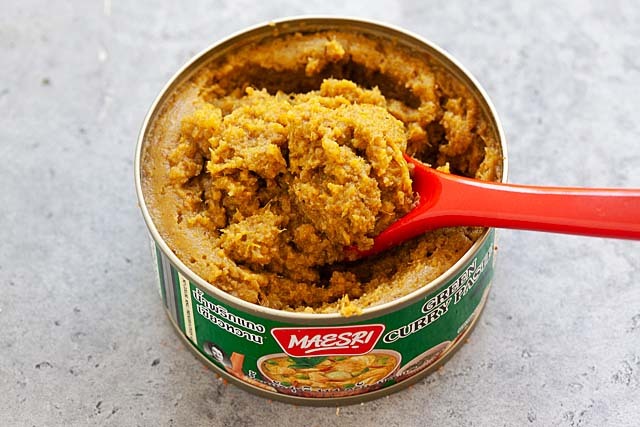 My favorite brand of green curry paste is Maesri brand Green Curry Paste. It comes in a small can so there is no wastage. You can use it for a few times and it can be stored in the refrigerator for weeks. Tips on How to Cook Shrimp Curry? Do not overcook the shrimp in curry. Shrimp cooks very fast in boiling curry sauce, so as soon as they turn pink and curl up, they are done. Shrimp curry is made with coconut milk. 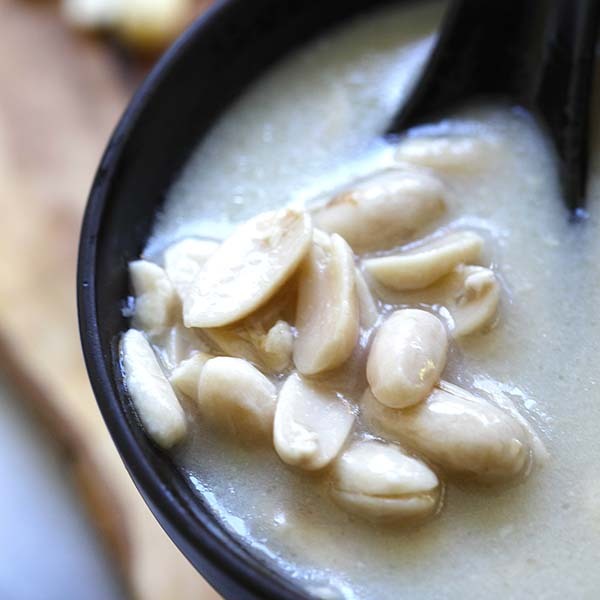 Buy canned coconut milk that is made in Thailand for authentic flavors. 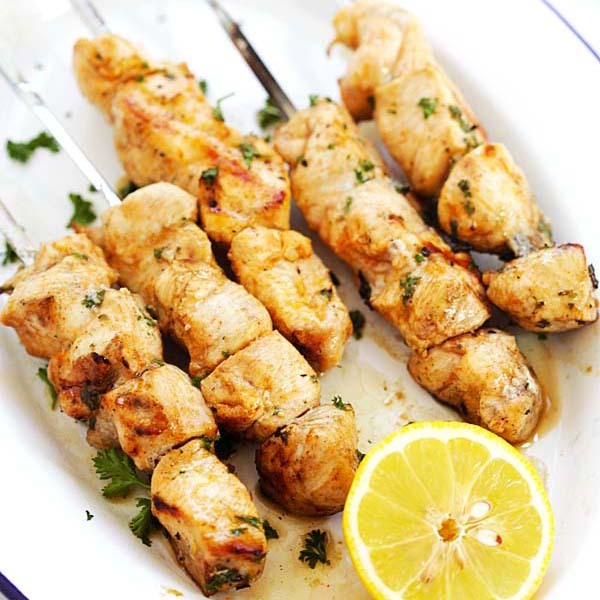 You can also use coconut cream for richer and thicker curry sauce. This curry has vegetables such as zucchini and red bell pepper in the curry sauce. Do not overcook them. 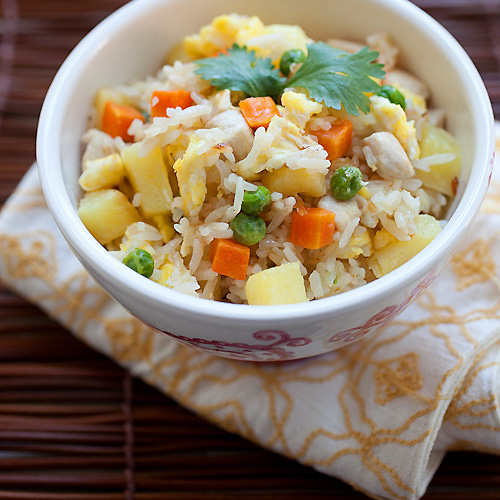 This meal is best served with steamed rice, just like the picture above. 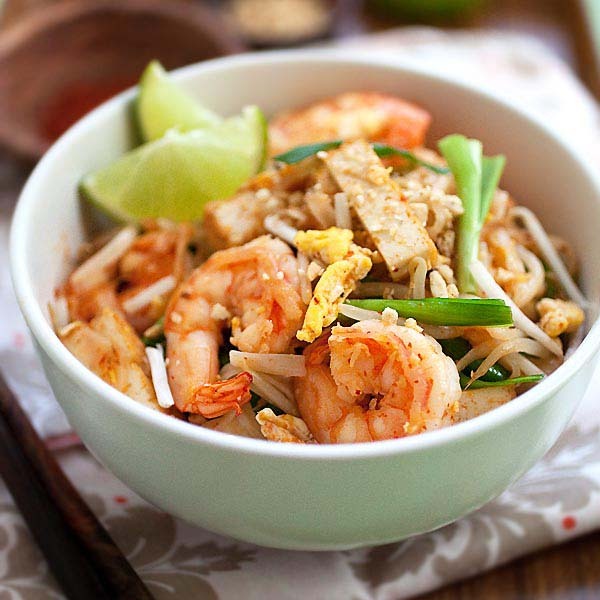 For a wholesome Thai restaurant meal and easy weeknight dinner, I recommend the following recipes. 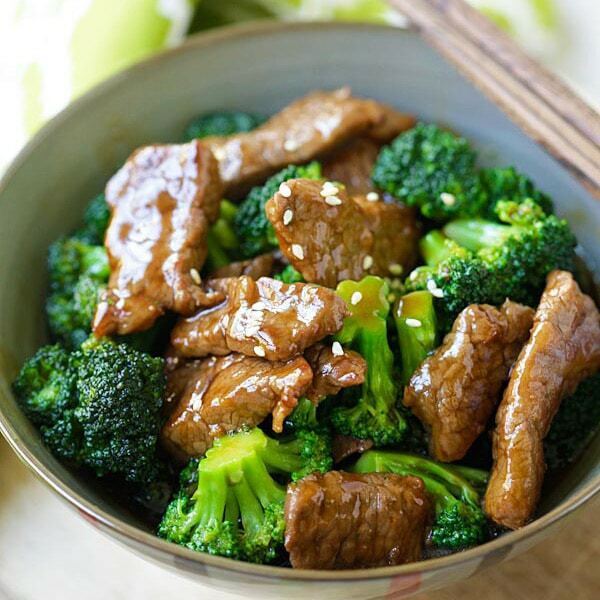 This recipe is healthy with only 247 calories per serving. Shrimp and vegetables are both low calories and there is no carb in the dish. 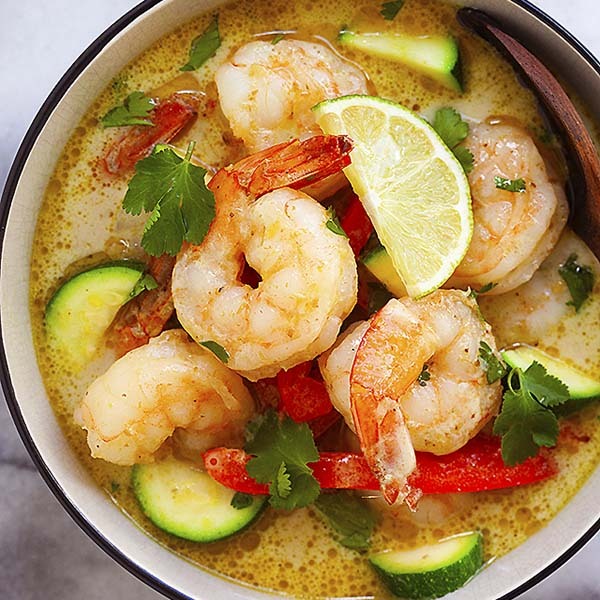 Delicious shrimp curry made with Thai green curry paste. This authentic Green Curry Shrimp recipe takes 20 mins to make and tastes just like restaurants! Heat up a small pot on high heat and add the cooking oil. When it's heated, saute the green curry paste for 10 seconds before adding the water. Bring the water to boil and add the shrimps. As soon as the shrimps are cooked, add the coconut milk, fish sauce, palm sugar, zucchinis and red bell peppers. Cook for 1 minute, stir to mix well. Turn off the heat and add the chopped cilantro. Serve immediately. All of these recipes look fabulous! I can’t wait to try them! Thanks for sharing! 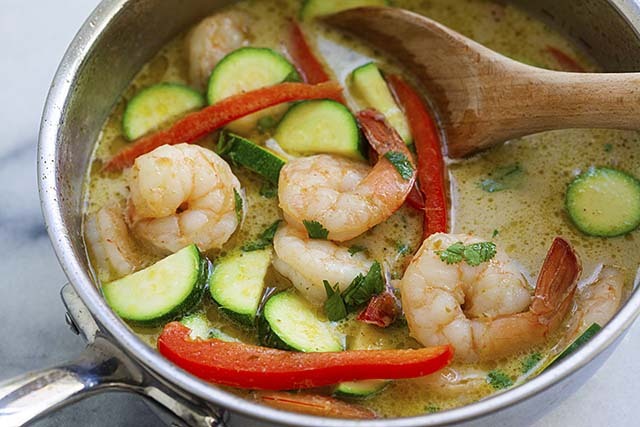 Awesome, please try this green curry shrimp. It’s so good! Is there a vegetarian equivalent of fish sauce that would add the same type of piquant flavor? Or can this recipe just skip the fish sauce. I plan to use tofu instead of shrimp. Hi Julia, all Thai food uses fish sauce. I am not sure if there is a substitute for fish sauce. I will just add salt. Thanks Gorgette you can get the ingredients online! I made this last night and it was delicious. Since I live at high altitude (6500 ft) I was worried the vegetables wouldn’t cook enough in the quick time called for so I sauteed the zucchini and red pepper first then pulled them out of the pan before cooking the shrimp. The vegetables were al dente and the shrimp and sauce turned out great! Hi Radina, it’s not curry if there is no coconut milk. You can try to add milk, though.